Flowers left at St Clare of Assisi Primary School pay tribute to the father who died in the explosion. File photo. WorkSafe ACT has confirmed that a leaking gas bottle was the cause of the explosion that killed a Conder father at his child’s school last Thursday. The work safety regulator has also confirmed that the 51-year-old man was standing next to his vehicle when it exploded in the St Clare of Assisi Primary School car park just before 5 pm. The man was there to pick up his child from after-school care. Police have not released his name. Work Safety Commissioner Greg Jones said preliminary investigations into the incident indicated that an acetylene gas bottle had leaked into a compartment at the back of a work ute, and an ignition source then caused an explosion. WorkSafe has issued a reminder to industry about the safe storage and transportation of gas cylinders. 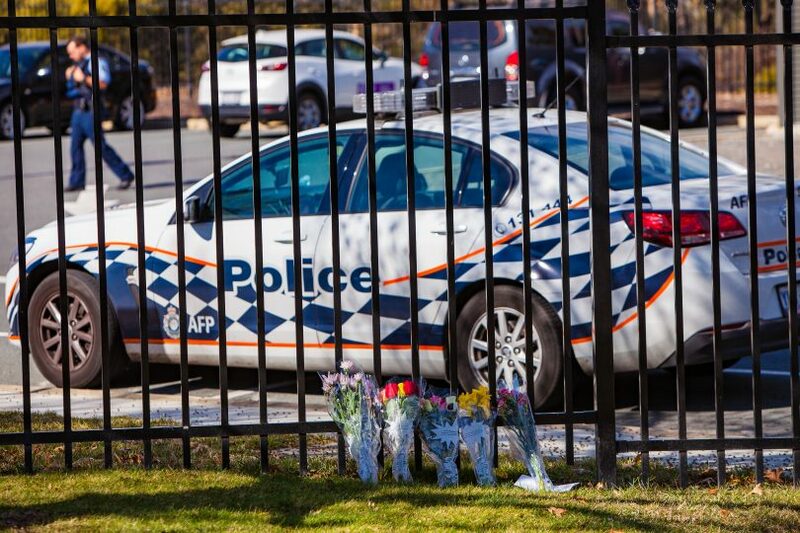 “WorkSafe ACT continue to work with ACT Policing investigating this tragic incident and our thoughts remain with the friends, family and colleagues impacted,” Mr Jones said. “Acetylene is a fuel gas which when combined with oxygen is generally used for welding, cutting, localised heating and flame hardening. “Acetylene and other flammable gas cylinders including oxygen, propane and butane, are commonly transported in vehicles by tradespersons such as plumbers and construction workers involved in refrigeration, welding and gas fitting and other similar activities. “In addition, householders commonly transport their LPG gas cylinders when they get their BBQ bottle swapped or refilled. you are carrying a dry powder fire extinguisher. Mr Jones said gas cylinders must not be carried in the passenger compartment of any vehicle and good ventilation was essential. “If cylinders must be carried in closed areas of vehicles, a storage cabinet with outlets in the base of the cabinet vented outside the vehicle must be used,” he said. “Finally, ensure persons using or transporting gas cylinders are appropriately trained and instructed on the proper handling, storage and transport of gas cylinders including emergency procedures,” he concluded.